Is ∞+1 equal to 1+∞ in terms of addition? Is ∞ plus 1 equal to 1 plus ∞ in terms of addition? Infinity is one of the most intriguing notions of mathematics leading us to a new era of calculation but also might as well be trickier and hard to understand due to its definition. The problematic state of infinity instigates new thought experiments giving mathematicians the new apparatus of calculation including differential calculus and integral calculus. But, what is infinity, a countable set or a notion beyond our imagination? The definition of infinity is relative to the definition of the numbers because mathematical calculations are meaningless without definitions. If you treat infinity like a number, it causes equations like below. It is like finding your way in the everlasting dark without knowing the path in which you walk. Numbers had been the general term of object assignment in its very core, representing a 'number' of objects with an abstract term, for a long time. Imagine that you assign your one finger to an apple, you can count every single object with that finger, and eventually, it will become the notion of 1 in your brain. It is the way of counting things for primitive people, using pebbles and stones as a 'number'. Since stones, pebbles, and sticks are awkward to handle, people created symbols to represent numbers as soon as they learned to write. The symbol that is used to write a number is called a numeral(1). So if you want to count something, you have to attach it to a numeral, or an equation. Nevertheless, you cannot, occasionally, count things by using the natural numbers(1, 2, 3 …) because of their limitation. So you need the integers(… -3, -2, -1, 0, 1, 2, 3 …) to express addiction and subtraction. But, what if you need to divide or multiply? The technical name for all the fractions is the rational numbers(… -1/2, 3/2, 6/3 …) formed by taking ratios of the integers. And, an irrational number is a number that cannot be written as a ratio of integers(2), such as π and &straightepsilon;. This is a brief history of the advent of the numerical system we use to calculate, indicating the relation between countability and pairing things. But, what happens you add a number to a notion bigger than either numbers or objects you can imagine? I digress. The method of pairing things or objects up is called a function in mathematics. In other words, every input processed by a function turns into an output defined by the function. The group of things you paired with another group is called a set, for the following part, I is the input set(domain), and O is the output set(codomain). If a function relates each value in the I set with a different output value, it is called injectivity, and the function is called an injective function or one-to-one function. If a function uses all the values in the O set, it is called surjectivity. An injective surjective function is also known as a bijection or a bijective function. Now, return to infinity, imagine a bijective function that relates the natural numbers with an infinite set. This kind of infinite set is called countably infinite(3). The notion of countably infinite is also known as ω(Omega). So we can count infinite sets with this notion, but how we know its size to compare? If finite sets have the same number of elements, they are equinumerous(4). However, we cannot extrapolate that information from an infinite set by just comparing them. We, therefore, need a specific notion of the size of an infinite set, and the mathematical word for this is cardinality(5), defined by Georg Cantor. Now, with this notion, we define the smallest infinity as the cardinality of the set of the natural numbers because it corresponds to the smallest possible infinity. 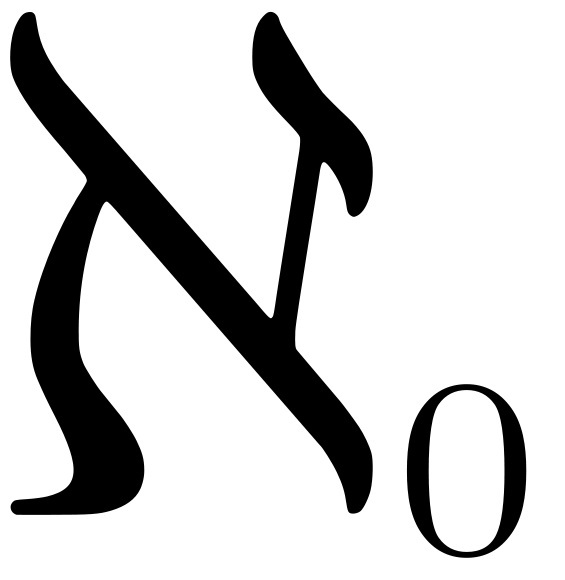 ℵ0, the first letter of the Hebrew alphabet, indicates the cardinality of the smallest possible infinity(the set of the natural numbers). According to the Continuum Hypothesis, the next infinity is the cardinality of the real numbers. This hypothesis might be counter-intuitive for you, but might also be the best way to understand the abstract terms of infinity. 2ℵ0 is the binary version of the number of the real numbers. And, 2 is not so arbitrary – it is the smallest base possible(6). Now, we know that infinite sets can have different cardinalities – different sizes. As a thought experiment, you are the owner of a hotel in which there are infinite rooms. What happens if every room is full and a new guest wants to register? This thought experiment is known as Hilbert’s Hotel. The answer is that you move the first guest to the second room and continue to do it for each guest. But, according to the cardinal numbers and the ordinal numbers(1st, 2nd, 3rd, etc. ), infinity plus one is actually bigger than infinity, as explained above. On the other hand, if infinity is added up to one thing, it corresponds to infinity. In other words, if infinite guests arrive after one guest register, you do not need to move anybody. a + b = b + a for any real numbers a and b. In other words, the order of numbers does not matter doing addiction. It is called commutativity of addition. But, it is not true for infinite sets as explained above. It is the mathematical and logical way(7) of saying that ∞ + 1 is not equal to 1 + ∞ in terms of addition. (1) F. Fehr, Howard. "Numerals." The New Book Of Popular Science Vol-1. Grolier Incorporated, 1988. 338-339. Print. (2) Cheng, Eugenia. "Irrational Numbers." Beyond Infinity: An expedition to the outer limits of the mathematical universe. London: Profile Books, 2017. 51. Print. (3) Cheng, Eugenia. "Countability." Beyond Infinity: An expedition to the outer limits of the mathematical universe. London: Profile Books, 2017. 74. Print. (4) Dubisch, Roy. "Set Theory." The New Book Of Popular Science Vol-1. Grolier Incorporated, 1988. 443-444. Print. (5) Cheng, Eugenia. "Comparing Sets of Things." Beyond Infinity: An expedition to the outer limits of the mathematical universe. London: Profile Books, 2017. 113-114. Print. (6) Cheng, Eugenia. "The Next Infinity." Beyond Infinity: An expedition to the outer limits of the mathematical universe. London: Profile Books, 2017. 117. Print. (7) Cheng, Eugenia. "Infinite Queues." Beyond Infinity: An expedition to the outer limits of the mathematical universe. London: Profile Books, 2017. 130. Print.